And blights with plagues the Marriage hearse"
"THE VEILED SIBYL (Stabs herself.) My hero god! (She dies.)" "Ibiza is female, magic and dangerous. Under the sign of the Scorpion it has a high creative activity, but it’s also a place of suicide, death and satanic vibrations." "This painting portrays the 'Soul's Beauty' . 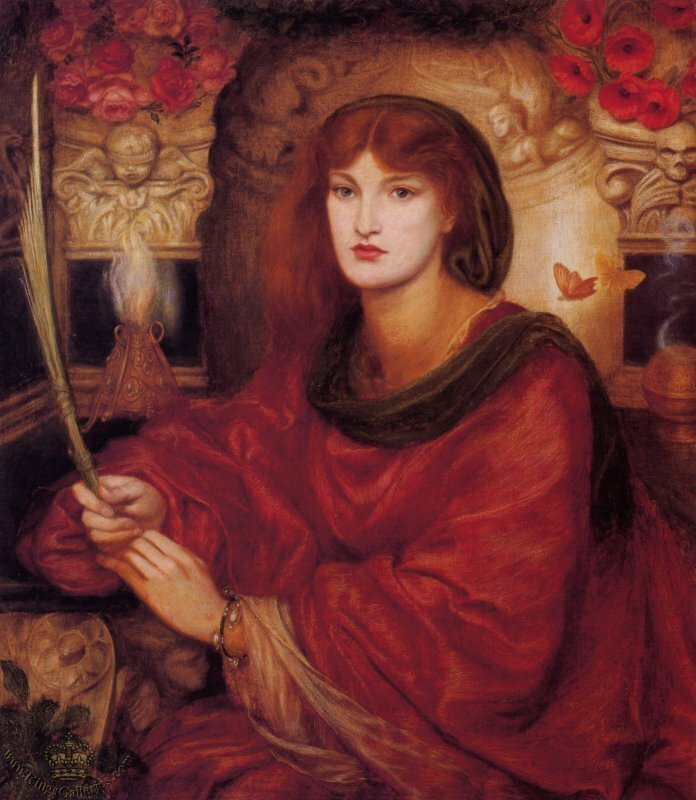 . .
"Under the arch of Life, where Love and Death, Terror and mystery, guard her shrine, I saw Beauty enthroned..."
As a companion piece, Rossetti painted Lady Lilith . . .
. . . portraying the 'Body's Beauty' in the person of the sensual demon who, in Jewish legend, was Adam's first wife." Rossetti's Sybilla and Sinfield's The Letters are both idealized portrayals of a woman. Loyal beyond reason, the highly theatrical death of the wife in The Letters , like a scene from a play, gothic romance or an opera, is taking place in the theatre of our wanderer's mind. What seems to be occuring in the physical world is actually taking place within the psyche of our protagonist. In Homer's Odyssey , Joyce's Ulysses and Sinfield's Islands female characters are representations of the inner life of the protagonist whose quest it is to come to terms with the unconscious parts of the self. Like the Formentera Lady, the sailor's "wife" and the "ladies of the road" are anima figures. "She is often connected with the earth, or with water, and she may be endowed with great power. She is also two-sided or has two aspects, a light and a dark, corresponding to the different qualities and types of women; on the one hand the pure, the good, the noble goddess-like figure, on the other the prostitute, the seductress, or the witch. It is when a man has repressed his feminine nature, when he under-values feminine qualities or treats women with contempt or neglect, that this dark aspect is most likely to present itself. Sometimes she appears to be faery-like or elfin in character and has the power to lure men away from their work or their homes, like the sirens of old or their more modern counterparts." The wife in The Letters is analogous to Calypso, a character in The Odyssey. "Calypso is the pure, remote feminine, untouched and inaccessible, separate, distinguished and different from the world of men,(or the view of the world by men). The surface image of Calypso is like an incredibly pure, charismatic, and beautiful image to which the hero can dedicate acts of heroism, virtue, wisdom, and spirituality, utilizing her as an image of his own higher nature, his soul, so to speak." Like the death of the Sibyl in Ulysses , the death of the aggrieved woman in The Letters symbolizes the complete split between the sailor's conscious ego and his unconscious. Ran to the day with tear-blind eyes." Conscious ("the day") is now cut off from the unconscious (night, anima, "the wife"). The psyche has split into its component parts (Thinking, Feeling, Sensation, Intuition). In all hero epics, a sacrifice of some kind must be made. A part of the hero must die in order to effect rebirth and this aspect of The Letters indicates that we are still in the constellation of Sagittarius.
" impaled on nails of ice"
... and spend three days in Hell (Hades) before his resurrection. Odysseus entered the land of the dead in order to leam what he must do to return to a past existence. "The land of the dead. Not an 'underworld', but an island somewhere in the Atlantic past Gibralter (the 'Pillars of Heracles)'.."
"When Chiron (the constellation Sagittarius) was wounded, by most accounts, in the thigh, it was a wound he could never recover from and only death could bring him relief. As with healing the inner wound, some part of us has to die to bring about healing. Once this happens, our true creative potential is released and wholeness can result. Chiron willingly gave himself to Death, but it was not a suicide. The only way Prometheus could be freed was for a god to give up his mortality and enter into Hades. It was meant to be an unbroken punishment for Prometheus, for it was not conceived that this could ever happen. Chiron willingly fulfilled the price and Prometheus was unbound to once again help his beloved mankind. Chiron is seen as a "Christ" figure in that he was an innocent who was wounded and suffered, then dies so that all of mankind may live. Like Jesus, for Christians, Chiron is seen as the key to the door of enlightenment." Dante had, for his muse, Beatrice and Rossetti, Sybilla and, as mentioned earlier, for the wanderer, the wife in The Letters represents his higher nature, his highest ideals. She is the "madonna" while the women in Ladies of the Road represent the "whore". "The immediate consequence of the Fall of Adam and Eve is that they acquire moral knowledge. They can distinguish Good from Evil, God from Man. The Orphan's Fall brings the dawning of moral consciousness. Adam and Eve can tell "good" from "evil" as a result of eating of the Tree of the Knowledge of Good and Evil. Thanks to the new moral consciousness, the Orphan experiences the world in terms of dualisms. The world is painted in sharp contrasts of black and white, good and evil, in-group and out-group, the damned and the saved, pagan and Christian, etc. All of this effort is an attempt to maintain the ego inflation, the stance of the puer aeternus (divine child) in the face of the Fall." "The ego in its emergence from the unconscious unity of childhood undergoes a process of confrontations with the external world as other. In this process the developing adolescent ego experiences itself via reflections through which it begins to develop the personas with which it becomes identified - a subjective identity. The ego identified with personas must have the integrity of its self image challenged. It must meet with an opposition within capable of creating self doubt which demands a re-evaluation of its notion of `who it is'. This is only usually possible through some shocking confrontation with one's shadow!!!! - can it shore up its cracked and crumbling self image, or, if not - what is it to do about this new information that is forcing its way into consciousness? The adolescent ego thus exposed may cover up through angry reactions, denial and renewed projections, or it may lapse into a see-saw of vacillating identifications - swinging from the old to the new, with re-emergence of the personas/attitudes, then fits of despair over negative feelings when the exposed shadow cannot be denied or hidden. However this is not a deep enough change, but a response of the adolescent ego to its previous illusion of unity being smashed. A strong inner duality has been set up which the ego can no longer completely deny, and with it a deep feeling of inner conflict and splitness will keep breaking through into awareness."